Thiruvarur taluk has many famous temples where one sees a rush of pilgrims during annual festivals and fairs. The most famous is the Sri Tyagaraja temple and the annual Chariot festival which attracts pilgrims as well as travelers. The Arulmighu Sri Tyagaraja Temple in Thiruvarur is dedicated to Lord Shiva with his consort Uma, and Skanda as a child. 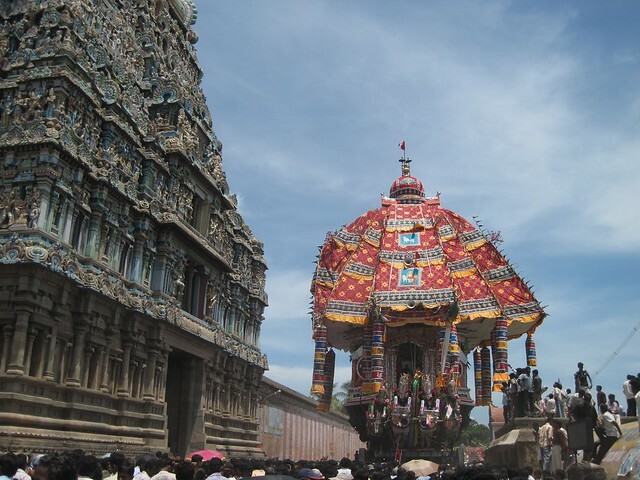 Another place of attraction is the Thiruvarur Temple which has the biggest Chariot in the state and has the Panchamuga Vadyam which is a musical instrument with five faces. Get enchanted by the Pari Nadaswaram and Panchamuga Vadyam playing in the temple premises. The other temples in the vicinity are the Shri Subramanyaswamy shrine in Enkan, Arulmighu Shri Rajagopalaswamy Temple in Mannargudy and the Arulmighu Shri Saraswathy Temple at Koothanur.